After undergoing seven cancer-related surgeries, this survivor used her experience to develop a product that makes acute postsurgical period easier for patients. The author prided herself on her professional nursing skills. 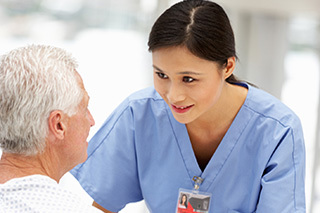 But a trip to the other side of the nurse-patient relationship changed how she provides care. A routine body check resulted in an unexpected diagnosis and an important lesson on the idiosyncrasies of cancer and cancer prevention. The seasons of the year serve as the ideal metaphor for the cancer patient’s journey from diagnosis to survivorship. The author reflects on enrolling in a clinical trial comparing active surveillance with immediate intervention in men with favorable-risk prostate cancer. The author describes the children’s book she wrote to make it easier to talk to children about cancer. The author describes his experience with colon cancer and the important role oncology nurses have played in his battle with his disease.